If you already own a home in Dollar Point and want to know what your property is worth, call me 530.414.1260 for a confidential consultation. 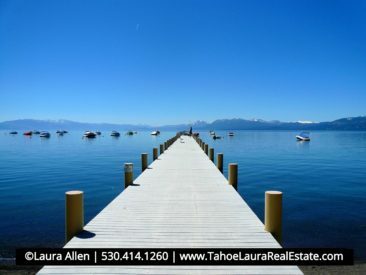 Approximately 40% of the homes are estimated to have some type of Lake Tahoe lake view. Panoramic to peeks of the lake. Dog Friendly Public Beach areas are located at the downtown commercial core area of Carnelian Bay and the beach area to the east of the Lake Forest Beach area. Sewer – All properties in the Dollar Point area must be tied into the Tahoe City Public Utility District (TCPUD) public sewer system. Septic systems are not allowed anywhere in the entire Tahoe Basin area. Optional, NOT MANDATORY, Dollar Point Home Owners Association (DPA) (think of this as a recreational club that limits membership to those who own property/land in the Dollar Point Subdivision) See details on DPA down below. One of the optional neighborhood features that most of the Dollar Point properties have for their owners is a club membership in the Dollar Point Association. Some real estate agents may refer to this optional “Club membership” as a “home owners’ association (HOA)” because membership into this club is restricted by geography. You can only obtain membership if you own physical real estate within the Dollar Point subdivision. Buyers’ Tip: It is important to know it is not a mandatory club/HOA, and it is therefore not subject to the Davis-Stirling Act California Civil Code that covers HOA groups and their mandatory disclosures to new owners – this is a club nor a mandatory Planned Unit Development HOA membership. Initiation Fee for properties in Dollar Point that are not a current member (never joined the DPA), the initiation fee is $25,000. Buoy Field Access. There is access for home owners that are looking for buoy access. See HOA rules on Buoys. Each session cost is $650, or $1,300 for the entire season (Year: 2018). Over 92% of the eligible properties are current members in the optional home owners association. Currently there are 524 members (homes) that have chosen to participate in the optional DPA program out of the 569 parcels in the subdivision. The Dollar Point Association has several home owner amenity recreational areas. 170 Observation Drive Gated Entrance | Pool, Three (3) Tennis Courts, Playground Equipment, Bocce Ball Courts, and Lawn-Area. The seasonal swimming pool is opens Memorial Day weekend and closes on Labor Day weekend (depending on weather could be open longer I September, but is seasonal). Need more help in trying to figure out your North Lake Tahoe home buying options? Do you want help figuring out the different neighborhoods, HOA fees and which area will best meet your needs? Call me at 530.414.1260 and I can help you find the right place to buy!